February 6, 2019 –Pensacola Beach, Fl—Famed for its soft white sand, emerald-hued waters, and a carefree, easy-going atmosphere, Pensacola Beach has long been a favorite, family-friendly beach destination that locals cherish and newcomers embrace. The Santa Rosa Island Authority (SRIA) is striving to keep it that way this Spring Break. Adult beverages are allowed on the beach. Glass containers, underage drinking and public drunkenness are not. Illegal drugs and driving under the influence will not be tolerated. Laws and ordinances will be strictly enforced, for everyone’s safety. In addition, motorized vehicles, generators, grills, fires and any open flames are prohibited on the beach. Rule of thumb: If you brought it to the beach, carry it back with you. Tents, umbrellas, chairs and beach gear are not allowed to be left overnight on the beach. Trash cans are provided near all beach entrances, and you are asked to fill in any holes you may dig in the sand. Dogs are welcome on the beach at two designated dog parks only. Rules of usage are posted on line and at the parks. As always, please be courteous and remove pet waste. Know how to swim if you are going into the Gulf, and always swim near a lifeguard. 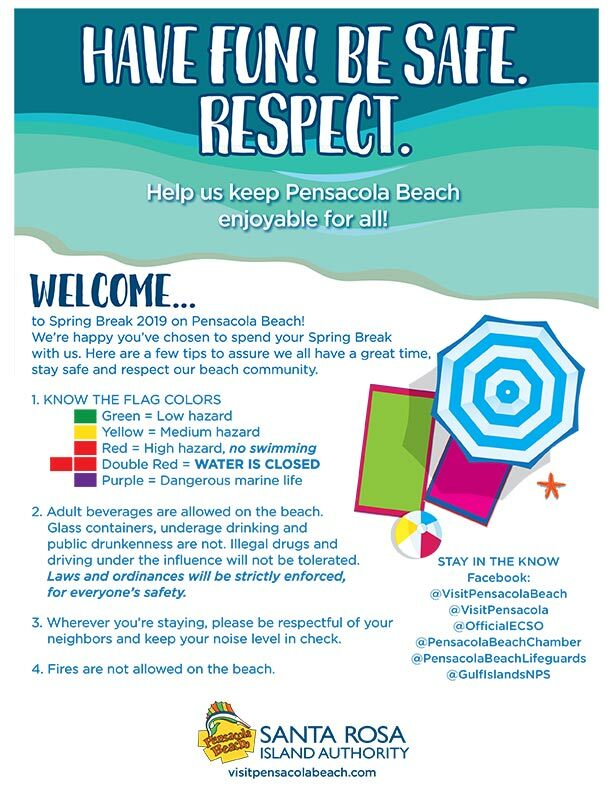 Lifeguards will be stationed on Pensacola Beach daily starting March 1 at Casino Beach, with patrols driving the island, as necessary. Lifeguard stations at Park East, Park West and Quietwater Beach will be manned depending on staffing availabilities. Green flag – Low hazard. Conditions are calm. Swim with usual caution. Yellow flag – Medium hazard. Moderate surf and currents. Swim with extra caution. Red flag – High hazard. High surf and dangerous currents. No swimming or wading is allowed in the Gulf of Mexico. Double red flag – WATER IS CLOSED. This is used during hurricanes or natural disasters. No swimming, wading or surfing is allowed in the Gulf of Mexico. Purple flag – Dangerous marine life is present. Exercise caution when in the water or on the shoreline. Pensacola Beach is owned by Escambia County, Fla., and is under the direction of the Santa Rosa Island Authority (SRIA). The SRIA was created by the Florida legislature in 1947 under Chapter 24500. The SRIA does not receive tax support from the taxpayers of the county. It is fully funded from lease fees collected from business and residences on the beach. The SRIA board is made up of six members; five are named by members of the Escambia County Board of Commissioners whose term is the same as the commissioner who appointed them. Registered voters on Pensacola Beach elect the sixth member. The elected member’s term is two years.